An example of the older type of Caithness croft building has been preserved by the trust. It is a long single storey building with the traditional byre being incorporated into the dwelling. there are many examples around the area which are now at different stages of decay. 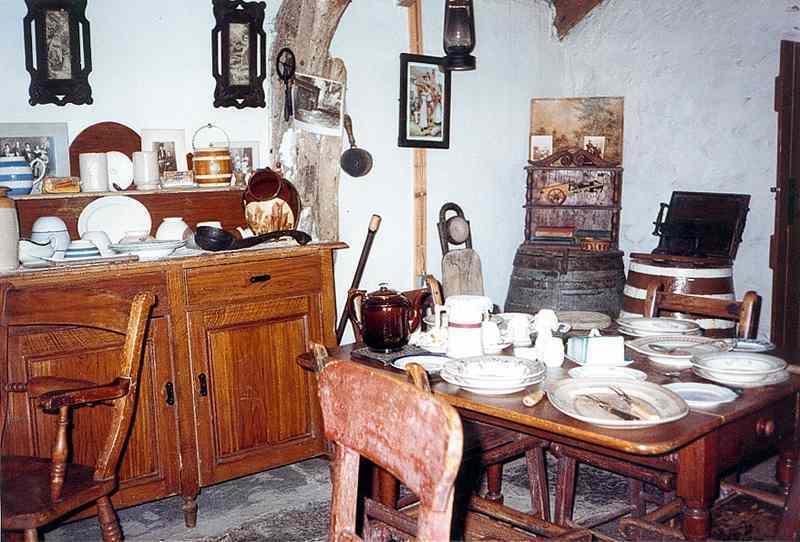 This example has been furnished with many of the traditional items which would have been used over the last 150 years. Many local people have donated items covering many periods and provide an interesting look at what has been used in the area. Personal belongings, kitchen implements and many farm tools and examples of old machinery are on display. The property has a thatched roof sitting on a bed of turfs or divots. The walls are pointed with lime and whitewashed. The barn is in excellent condition and shows many features from the period. A walk through the house will whisk you back to a simpler age and give a brief insight into the lives of the hardy crofters of Caithness. The croft is situated just outside Dunbeath on the main road north. There is a tearoom in a nearby building run by the members of the trust.